On the evening of Tuesday 24th May 2016 a fire broke out on a balcony of one of the Telford Homes new build properties at Rushton Walk by Ennerdale House in Hamlets Way. 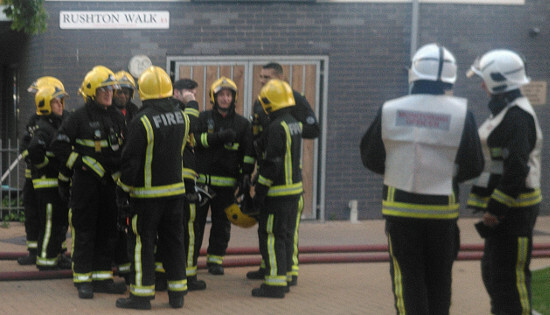 Four London Fire Brigade vehicles attended the scene. Initial reports are that the fire was caused by a malfunctioning “hot tub” on the balcony, Nobody was in the flat at the time and fortunately no one was hurt. A Fire Brigade Investigation Team arrived on scene shortly afterwards. ← Tower @ 562 Mile End Road – Back again… No …and its gone away again!